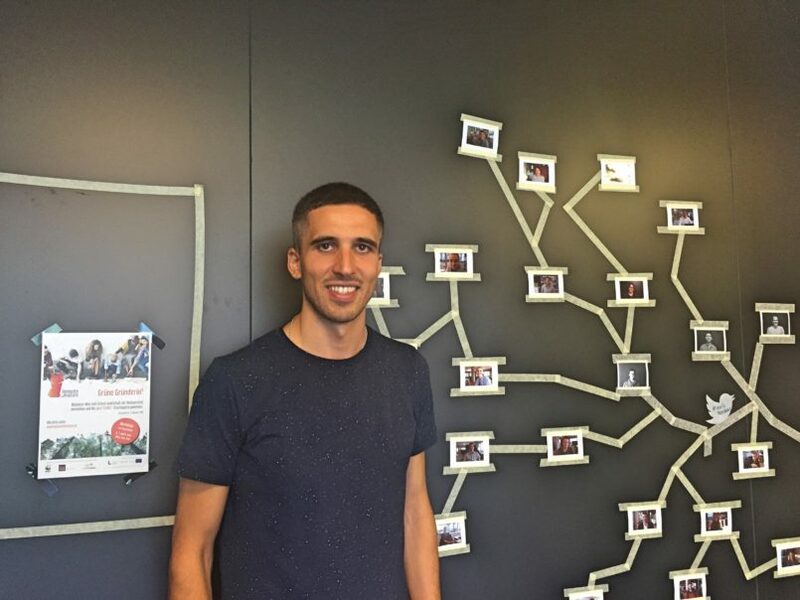 Der spanische Architekt Hector Pérez Romero sammelte im Rahmen von Erasmus for Young Entrepreneurs mehrere Monate lang internationale Erfahrung in der Tabakfabrik Linz. „An Linz schätze ich das tolle Kulturangebot, wie das Ars Electronica Festival. Die Tabakfabrik ist ein Ort, wo man die Transformation einer Stadt vom Industrie- zum Kreativstandort miterleben kann“, sagt der 32-jährige Baske, der in seiner Heimatstadt Bilbao ein Architekturbüro eröffnen und dort interdisziplinär mit DesignerInnen und KünstlerInnen zusammenarbeiten möchte. Zum Ende seines Aufenthalts in Linz hat Hector seine Gedanken zur „Tabakfabrik Experience“ schriftlich festgehalten. Every single day is a new experience, unique and once in a life time. Participating in the “Erasmus for Young Entrepreneurs” program has allowed me to enjoy every moment learning and participating in this great European project. Renovating the old tobacco factory is not just about cleaning, painting and rehabilitating the building. I firmly believe that the most important part is connecting people, workers and visitors by participating in this atmosphere of creativity. Here you can see the link between events, companies, the city and the industrial architecture of Peter Behrens. 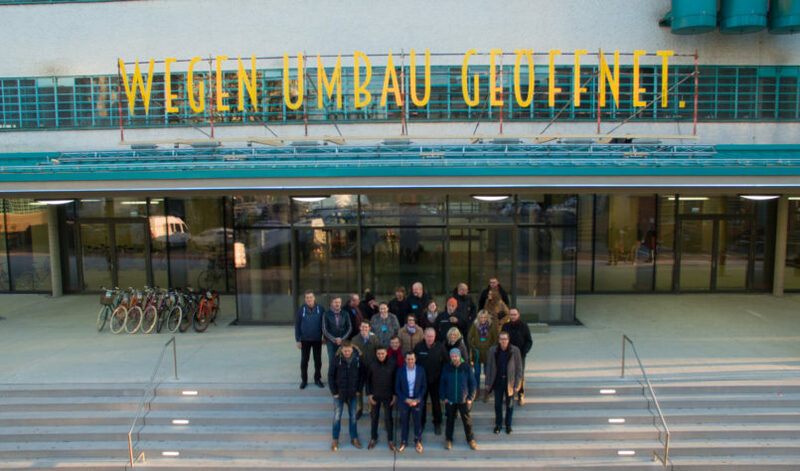 During my time in Tabakfabrik Linz I have participated in architectural projects such as the renovation of the new entrance “Wegen Umbau Geöffnet” and the organization of their new office areas. I have also enjoyed learning how they manage their agenda of events, exhibitions, concerts and how they transparently spread everything that happens through interviews, conferences and talks. Chris Müller as Director of Development in Tabakfabrik Linz takes care of this to perfection but this would not be possible without all the team that works hardly every day. Tabakfabrik Linz has uses as different as enriching within its entire varied environment. At Axis Co-working many professionals and entrepreneurs have their place of creation and a magnificent networking. In Red Sapata Tanzfabrik the creative industry is transformed into movement, dance, choreography and many other artistic disciplines. In the „Banana“ building there are advertising companies; “Lunik 2”, Fashion & Technology department from University of Arts, etc. Also like new additions, such as a stationery; “Gerstäcker”, a bike store an also in front of this area there is a temporary food trucks area. The growth of the tenants is becoming bigger and in the next years will be exponential. A great multidisciplinary team is necessary to keep moving this perfect huge machinery. This is where they work, from the backstage of this great stage the team of Tabakfabrik Linz. Also noteworthy is the work done by Creative Region on the development of the creative industries, the young entrepreneurs, the avant-garde ideas, the varied workshops and the networking between professionals, countries and companies. It has been enriching to see how Patrick Bartos, director of Creative Region, works with his team to publicize their creative business and how they get with the simplest elements they show us about the complexity of creation. „The creative industries are not important, they are fundamental.“ With a similar sentence, the cultural and social movement „Fair Saturday“ has been working since its birth in Bilbao to spread that „Culture is not important, but it is fundamental“ And this is a good example of the path that the old tobacco factory in the following years. A difficult path, rough terrain, often with no clear end. But if the goal is always in our mind we will achieve the best for Linz. I wish the best for the future of this magical place that I hope to visit again and enjoy its evolution. Thank you Tabakfabrik Linz for this unique experience.